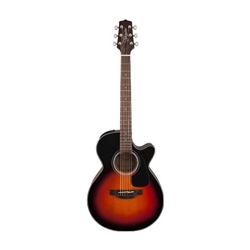 The GF30CE is a sleek-looking acoustic/electric guitar that features solid-top construction, superior-sounding electronics and Takamine’s diminutive FXC body style with a soft Venetian-style cutaway. A great choice for any player seeking the well-balanced sound of a small-bodied guitar, the GF30CE combines a solid spruce top with mahogany back and sides that produce notable sweetness and articulation. The slim mahogany neck and 12”-radius ovangkol fingerboard provide great feel and playability, while the onboard Takamine TP-4TD preamp system gives you a built-in tuner with three-band EQ and gain controls for excellent amplified performance and versatility.